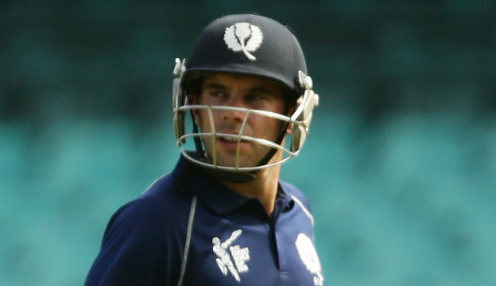 Kyle Coetzer, the man who led Scotland to an historic win over England last month, could make his second debut for Northamptonshire at Old Trafford on Sunday. Coetzer has been re-signed by the Steelbacks on a Twenty20 deal following a spate of injuries at Wantage Road. The 34-year-old captain of the Saltires - who struck a half-century in the remarkable six-run win over Eoin Morgan's men in Edinburgh - was in the Northants' final-day squad when they won their first title in 2013. Scottish players are good value Vitality Blast signings as they have no further international commitments this summer. Coetzer's team-mates Calum MacLeod and Shafyaan Sharif were recently loaned to Derbyshire in a partnership between the Midlands county and Cricket Scotland. "Kyle is a good T20 player and with us missing a few experienced players like Adam Rossington, Rob Newton and Rob Keogh through injury having someone like Kyle in the squad will be good for us," said Northamptonshire head coach David Ripley. "We're looking forward to welcoming Kyle back to the County Ground for the next few weeks." Meanwhile, another ex-Steelback, two-time Blast winner Mohammad Azharullah has been trialling for county second XIs in a bid to get a T20 gig. Azharullah, 34, turned out for Worcestershire this week, having featured in several matches for Derbyshire earlier this season. Northamptonshire, 1212/1 to win the Vitality Blast, have lost their first two matches of the 2018 Blast - with Leicestershire and Nottinghamshire both making scores of 219-6.